Hidden from the performer, yet in plain view of the audience, an alarm is set to go off and Laura begins. Her task?…to create an ending…her text?…the last lines of 100 Hollywood films. Mixing live performance and video projection, Finale… magnifies our struggle to find closure while poking fun at our attempts at constructing a perfect ending – in both performance and everyday life. 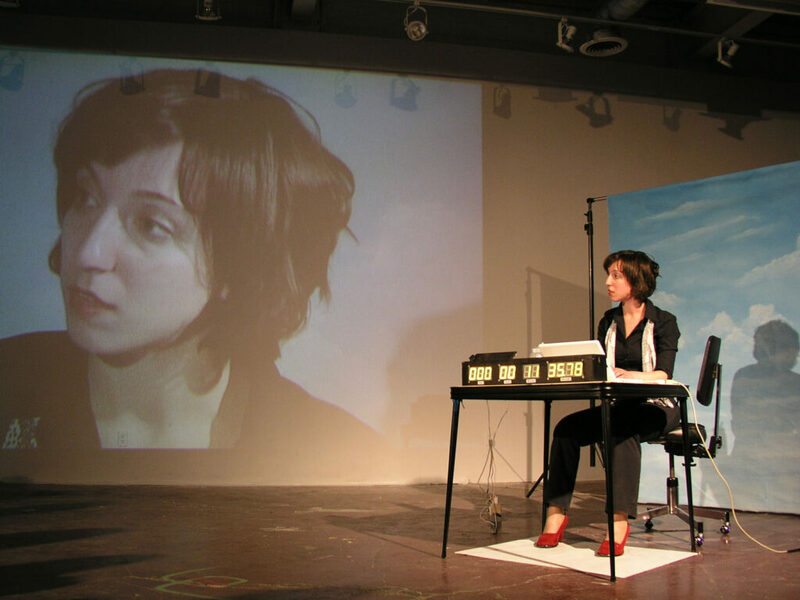 Laura Nanni works in the areas of performance, installation, direction, and design. She has exhibited works and participated in performances across Canada including group shows at Fifth Parallel Gallery (Regina), Koffler Gallery, OCAD, and U of T (Toronto), and Mobilivre (Montréal). She has worked with Soulpepper, the Stratford Festival, and Bluemouth Inc., and is co-artistic director of One Man Tag Productions. Laura’s most recent endeavour is The Automatic Tourist Project, a series of site-specific installations, mail art and performance works.